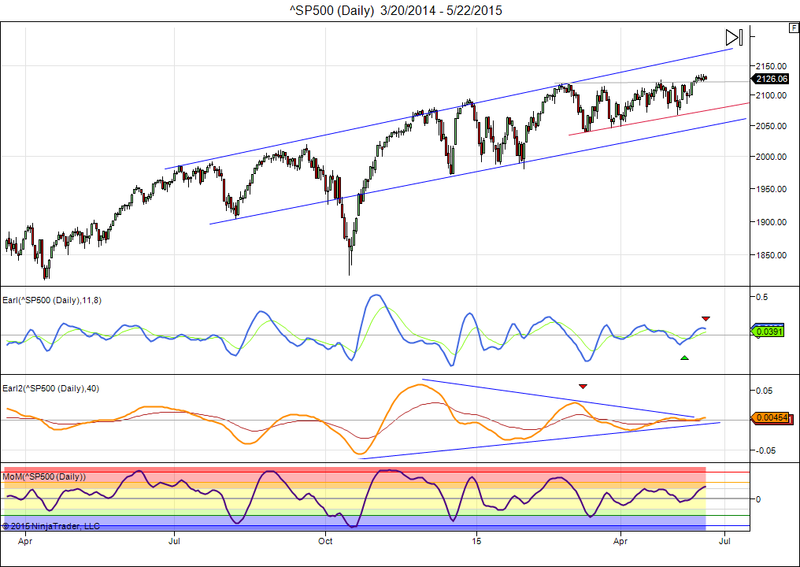 Markets kept up very well last week and stocks are still not in the mood for any pullback. That will obviously change some day, but when? I don’t know how many under water shorts are still waiting for a decent chance to get out, but that could be one of the reasons why this market has refused to pull back since its new record highs. While the S&P 500 is at new highs the Nasdaq still has quite a few hurdles in front of it before it can do the same. The 5100-5200 area is heavy overhead resistance in this index. The Earl index (blue line) has started pulling back from a major high, but the market is not coming along. Meanwhile a new lunar green period is starting, which normally favors further gains. But the lunar cycle hasn’t worked well so far this year, so we better be careful. The slower Earl2 (orange line) is still headed higher, suggesting further gains in the pipeline. I see a very mixed technical picture, so I am not going to commit too strongly either way at this point. The short term momentum is clearly up, but that can change very quickly. We will probably get more clarity soon. The S&P 500 reached new record highs last week, the Nasdaq is coming very close to a new all time highs as well. Some consolidation after the recent rally is normal, and we are in a new lunar red period. A further rise in June is likely if the market doesn’t give back too much of its gains in the coming weeks. My indicators are still fairly neutral with the Earl turning down slightly and the slower Earl2 going up after printing a very shallow bottom. Next resistance is near the 2200 level, but a drop back below 2100 would make last week’s highs look like a failed breakout. This can go either way, but it remains a market that is inching higher until proven otherwise. This is the kind of situation that demands patience and “go along with what comes along”. I am getting frequent questions about the Earl and Earl2 indicators you can find in most charts on this blog. So, I have now put up a new permanent page on the blog, explaining them in more detail. You can always find it through the links on the left side , see “Pages”. As always, your questions or critical remarks are welcome.